Vol. 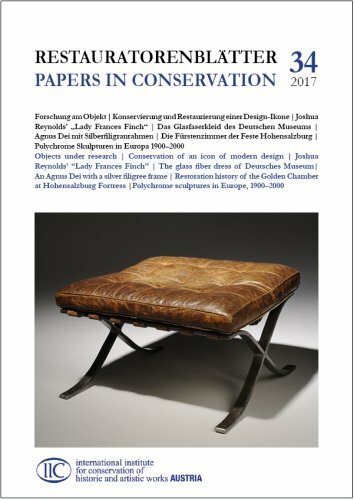 34 deals on "Objects Under research"
The Restauratorenblätter- Papers in Conservation are published annually for IIC Austria since Autumn 2014 by Verlag Dr. C. Müller-Straten, Munich, Germany. Attention: vols. 32-34 are published only via this publishing house. For earlier vols., please get in touch with IIC Austria or specialized book dealers and have a look at the IIC Austria homepage www.iic-austria.org. 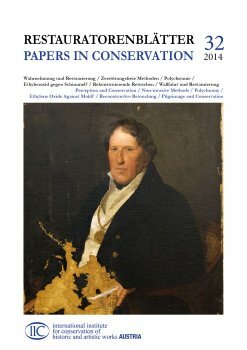 Since Autumn 2014, this important and established media publishes contributions according to a focus theme with full texts both in English and German. The format is DIN A4 with usually 256 pages and hundreds of color plates. The below mentioned price is valid for non-members. Members receive the book, among other advantages, automatically after publication at a reduced membership offer. Please keep in mind that additional PAP is charged which may differ from country to country. The Spun-Glass Dress from the Deutsches Museum (Chicago 1893). An Evening Gown as a Masterpiece of Science and Technology?